MK Dons are no stranger to an upset in the second round of the League Cup, and both Paul Tisdale and Baily Cargill see no reason why they cannot cause another on Tuesday night. Premier League Bournemouth are up next for Tisdale's side when they travel to the Vitality Stadium, eager to repeat the feat of four years ago when they played arguably the biggest game in their history, beating Manchester United 4-0. 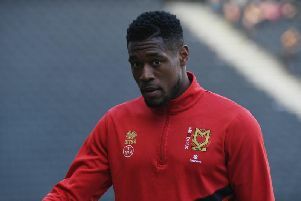 Cargill, who recently swapped Bournemouth for Milton Keynes, is inline to play against his former club after a man of the match performance against Exeter on Saturday. He predicts a tough night at his former club, but believes Dons can cause an upset. "Why not?" he asked. "Every game is winnable, why can't we go there and win the game and come away with a win and go into the next round - I can't see why we can't. "Eddie used to change the whole team from the Saturday, but it was still a strong side. He liked to give the team a rest and give the other lads a chance to show him why they should be in the team,. He likes to have two players in every position so it will still be a strong side. There won't be kids out there, but some really top players. They're all Premier League players. "It will be a tough game, they'll pass it well, it will be taxing on the legs because they will keep the ball moving. But I'll be happy to play and I'll give it my all if I do." Manager Tisdale says Dons have nothing to lose in the clash. He added: "We're really looking forward to going down there, I'v always enjoyed matches down there. I know Eddie and his staff really well from over the years. "We'll look forward to it, we have nothing to lose. The players should be looking forward to it and hopefully we'll take some supporters down there to enjoy the evening too."